Raise your hand if you like changing your cat's litter box. Anyone? Anyone? We thought not. No one really likes to go through the process of changing litter, but it’s something that we do anywhere because we love our cats and we want to keep them. But what if you could get an automatic litter box that took care of the problem for you? With our automatic cat litter box reviews, you’ll know just which ones to look at too. Multi-Cat: Does the litter box work for more than one cat? If it doesn’t you need to know because when more than one cat uses it you could have a problem on your hands. Preparing for what you need is important. Automatic: Is it actually fully automatic or is it semi-automatic? You want to know what you’re getting into here and make sure that you get what you really want. Semi-automatic isn’t going to give you as many of the features. Dimensions: What is the size of the box? Getting a box that fits into the space you have available is important. It’s also important to make sure that your cat can comfortably get into the box and do what they need to do. Flushable: Is it actually flushable or do you need to make other arrangements? Once again, this is going to be a personal preference but it’s something that you definitely want to know about before you pick out something. Power: How does the litter box get the power that it needs? Does it need to be plugged into a wall or do you need to change out the batteries? Does it not have any power to it at all? This is an important feature to consider. Warranty: How long is the warranty? As with anything else a longer warranty means that the company is going to stand behind their product and that’s something you definitely want. The longer the warranty the better for you. There are plenty of cat litter boxes out there and there is actually a range of different automatic cat litter boxes as well. Finding the right one could take you forever if you had to do all the research yourself. If you take a look at our top ten options however you’re going to be off to the right start already, without having to worry. This is possibly our best self-cleaning cat litter box for a number of reasons. Even though it’s not flushable, it is fully automatic and provides you with electric power to make sure it’s always running and there’s no need to ever change the batteries. All you have to do is fill the box with litter and it takes care of cleaning for weeks without you having to do anything at all, keeping the odor out and the visible odor down as well. The crystals are even designed so they don’t attach to your cats’ feet and track through the house. When you’re ready to change it out you just pick up the litter tray and throw it out then start over. You don’t ever have to scoop or touch any of the mess that comes along with having those pets. Just toss it out and you’re ready to go another several weeks. Our budget pick is still possibly the best litter box for large cats. It’s a self-cleaning box that doesn’t require electricity to use. It’s able to simply rock back and forth in order to separate out waste from clean litter. The waste is dropped into a pullout tray so you can dispose of it easily. The entire process means that dust and odors are kept in the box, so you don’t have to worry about them tracking through your house. It’s also great for even multi-cat households or those who have large cats. That’s because it’s designed with a larger opening to make it easier to get in and out. Inexpensive, but definitely not lacking in quality, this is a great option for you if you want something simple to use but that also gets the job done. After all, you don’t want to spend your money on a litter box that doesn’t take care of the waste that you don’t want to touch. This self-cleaning cat litter box is designed to wash itself clean and make sure that waste is completely flushed away. All you need to do is hook it up to cold water and an electrical outlet and it will take care of the rest. 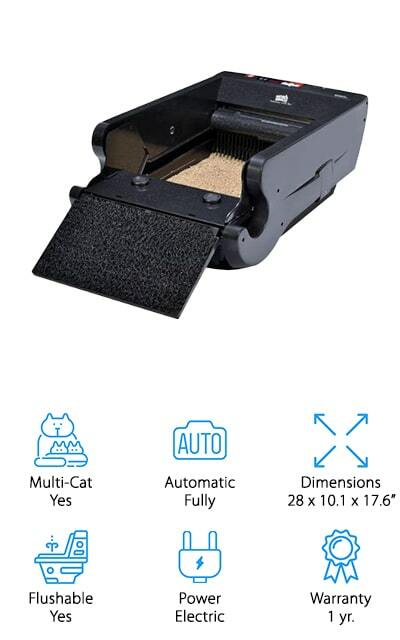 Made for up to 2 cats of average size, this box has washable granules instead of litter that still allows your cat to dig but doesn’t make a mess all over your floor when they climb in or out of the box. Included in the package are the granules and a SaniSolution cartridge that cleans the box and makes sure it’s ready when your cats need it again. Completely dust-free you don’t even have to push the button to clear it because you set it on a schedule. Once you get the schedule set up it will take care of the waste entirely on its own, so you’re able to stay away from the mess. 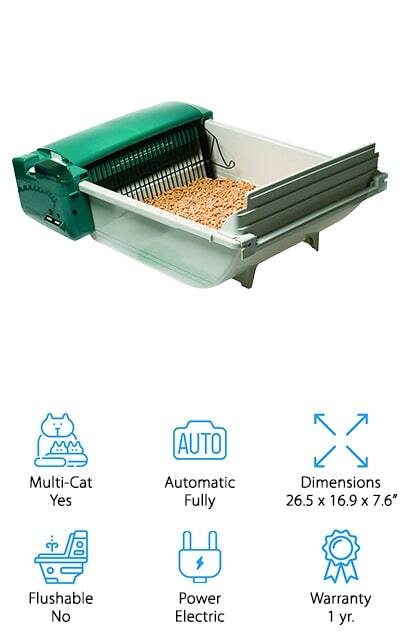 You’ll get a whole lot of self-cleaning capabilities when it comes to this litter box. It’s able to control odor using special receptacles and also has carbon filters that will keep any odors inside the box rather than letting them spread to your house. Not only that but it senses when your cat uses the box and then cleans and scoops immediately after each use. That way you can make sure your house smells (and looks) great all the time. It’s also compatible with your favorite type of litter so you don’t even need to make any changes to what you buy. You’ll get a 1-year warranty included with the box and it even has a ramp that makes it easier for your cat to get in and out comfortably. 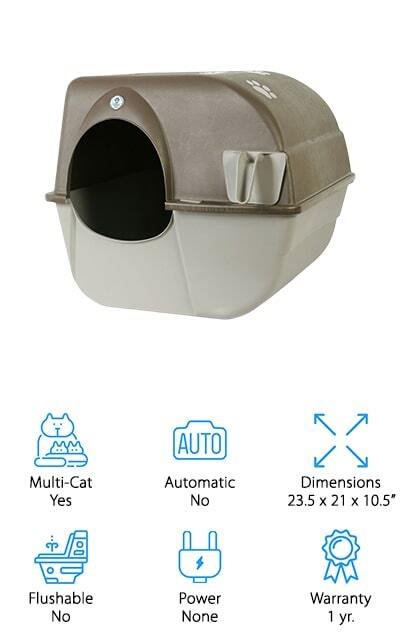 Great for homes with multiple cats it’s able to hold more litter and work for even larger cats as well. When it’s full you just dump the tray and you’re ready to go again. 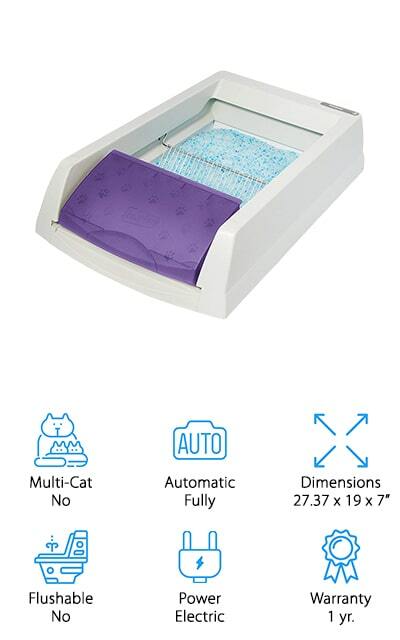 With this litter box, you get to avoid the scooping and cleaning for weeks without having to worry about the odors that you typically get from any box. It absorbs urine and can dehydrate solid waste, which gets rid of the odors and makes sure you don’t have to touch anything. The special crystals are also designed to make sure that your cat doesn’t track them all through the house and they don’t give off dust. Since you have a plastic lining you don’t have to worry about leaks either. All you have to do is pick up the tray and throw it out. If you really want to keep track of how your cats are doing the health counter included in this box will help because it lets you know how many times your cat uses the box and it automatically recognizes when your cat re-enters the box. You’ll have a full 1-year warranty to count on as well. You’re going to have a super durable box when it comes to this one because it’s got metal gears and a powerful motor that keep it running like clockwork. You can use absolutely any kind of clumping litter that you want so there’s no need to worry about changing over the litter you use. It’s also able to differentiate between clean and dirty litter so you don’t waste any. On top of that, it’s super quiet, to make sure it doesn’t disturb you or your cat while they’re using it or while it’s cleaning after. Included in the box are even bags that will last up to a month, so you don’t even need to get replacements until after you know it’s going to work for you. Just fill it with litter, plug it in and you’re going to be ready to go. It even comes with a full year warranty. 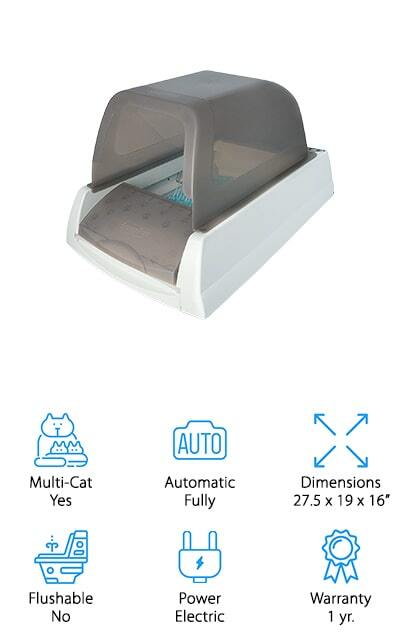 This super unique cat litter box actually looks like a baby bed, but it’s designed to keep litter up off your floor and make sure that your cat can easily use it at the same time. Designed with a separation grid that filters out waste, it also has a drawer that you can pull out to dump the waste without ever having to touch anything. Large enough to accommodate even larger cats, it actually uses an environmentally friendly material that is safe and non-toxic. Not only that but it doesn’t corrode so your pets and your family are safer. There’s no power to this unit so all you need to do is find where you’re going to store it and you’ll be ready in no time. Your cat will be able to jump right in and do what they need to do and get back out without making a mess. 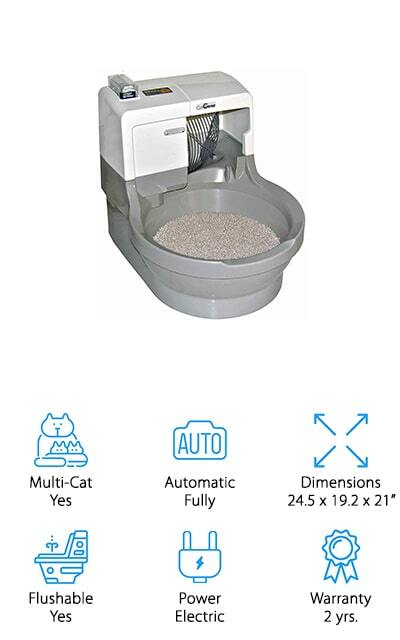 Here you’re going to have an automatic litter box for multiple cats that really does get rid of the scooping. You get rid of the odor at the same time too. All you need is a clumping litter and you’ll be able to get started. It filters out waste and debris and makes sure it’s dropped into the waste bin, which you can even line with a bag to keep it cleaner. You just plug the unit into the wall and it takes care of the rest. With multiple cats, you may need to empty it more frequently, but you’ll be able to take the scooping out of the equation. 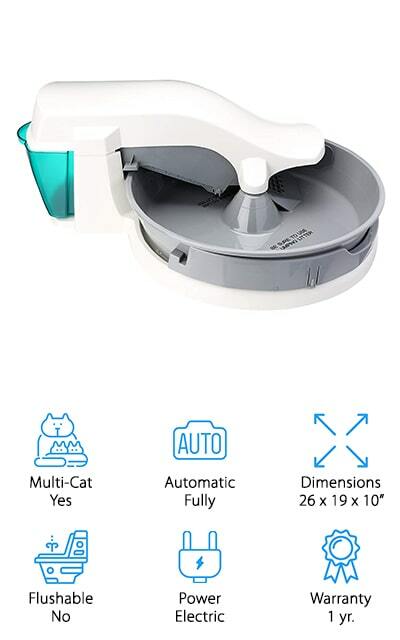 Designed for cats up to 15 pounds, this box definitely has a unique design and as it spins it will take care of everything so you don’t have to. The moderate size and the moderate price definitely make it a great option for many pet families. This box actually gives you everything you’re going to need, including a ramp to help your cat get up into the box when they need it. 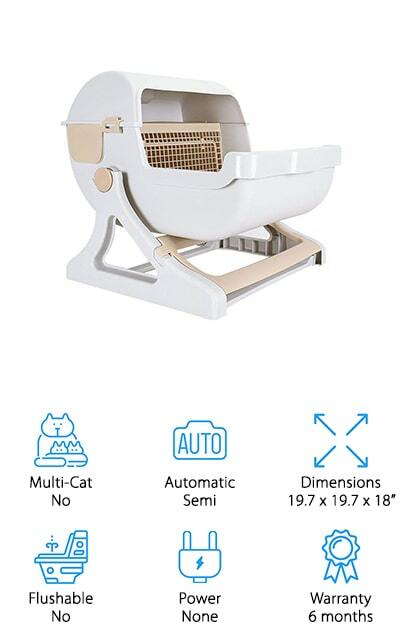 The durable drive mechanism keeps it going with ease and the extra-large size and high sides mean that you won’t have to worry about your cat being comfortable enough or getting litter on the floor. 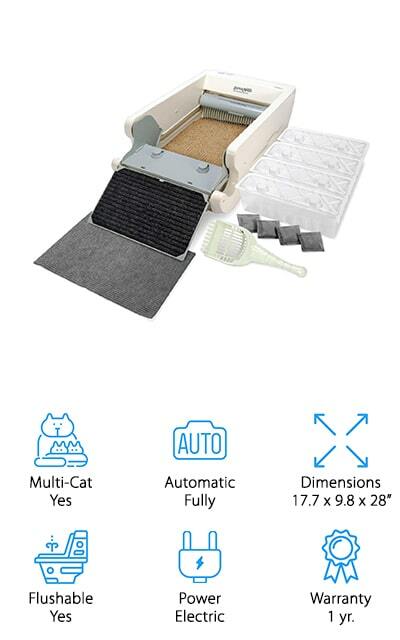 It’s designed for households that have multiple cats and even has an automatic rake to help with the cleaning process. All you’re going to need here is electricity because it’s ready to go just that easily. If it starts with your cat or anything else in the way there’s even a safety bar that stops the rake immediately. Complete with a 1-year warranty you really can’t go wrong here. Available in three different colors for your own fun (and your cat's enjoyment), this might be the best litter box for big cats because it really does make it a little bit interesting. The unique look of the box makes it easier to put in just about any part of your house and the fact that it separates out the waste makes it easier for you to get rid of. There’s no power required with this box, which makes it even easier to put anywhere you want and it can be emptied super easy. When your cat jumps in and out of the box it actually rocks the entire thing, making sure the waste is filtered out so it’s easier to remove. That’s all it takes to get the job done and that makes the entire process much better for you, no more touching anything.